New Gods? Meh, didn't even like the old ones much. 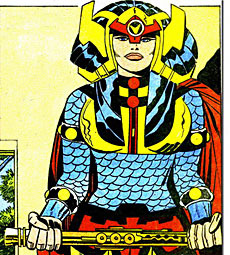 Warrior goddess and Female Fury, Big Barda gives her heart and soul for the New Gods. After defecting from Darkseid's elite army, Barda escapes to Earth with Mr. Miracle. Possessing superhuman strength, she's virtually indestructible. An armoured warrior wielding a Mega-Rod, she can manipulate space and energy - and heal others. Honestly, I've never much cared for Jack Kirby's "Fourth World" - I'm sure it's fun for those who like it, but that ain't me. Maybe it's just because I'm the wrong generation to have gotten it both barrels straight to the chest, or maybe it's just that DC's so determined to trainwreck their cosmic-scale storytelling that the last thing I ever wanted was to go back and read more of it, regardless of what sub-section we're talking about. Could be either; I don't like the art much, on top of that. Still, Big Barda did time with the Birds of Prey during Gail Simone's run, so even if this is the wrong era and wrong art style, I'll have a figure of her, thanks. Knowlessman that I am, I can still spot Fourth World imagery when I see it, and Barda's full of it - the squat, blocky proportions, the aggressively bright neo-medieval fashion, she looks more like a cartoon character than comic book hero (my gradient-shading bias showing there, I suspect). Whether or not Kirby fans will accept it with open arms or harp on about some minute discrepancies I can't say, but among a diverse collection, the style gives Barda a distinctively powerful, solid look. Even heroines notable for their impressive musculature, like Power Girl or She-Hulk, tend towards a kind of sculpted, super-fitness-model build - Barda, with her wide torso and thighs, just looks plain old tough. For all that her style is bold and bright, DC Direct haven't skimped on fine detail. Her chainmail is fully detailed, on the yellow armour sections like her breastplate and skirt there are tiny cracks to show that she puts it to good use, and all of the painted detail on the chest and belt and so on is supported by moulded lines. Her cape is good work, nice and dynamic without billowing out too far from her body - handy when you're working with crowded shelves - or being too dramatic, such that it wouldn't look decent when she's posed just standing still. The only shortcoming I'd really point to is that her hands seem a bit small, especially the fist on the left, but perhaps that's just a matter of her other parts being somewhat over-sized. Her face is quite good - I like it, and with the art I'm not predisposed to, so there you go. It's faithful to the flat, blocky style, but augmented slightly in the process of transitioning to 3D, with a gentle roundness to her cheeks, and a nice fullness to her lips, that make her a lot more attractive than I was expecting. The paint is quite intricate, with shallow shading in the nostrils, dark outlines around the lips and eyes, and a gloss on the eyes. Articulation is surprisingly plentiful, with a fair few additions to the DC Direct standard layout. She's got a balljoint neck - the two flaps of hair, or whatever they are, lying over her chest are soft plastic and allow the head to move easily - and a swivel waist, unfortunately a bit too high up to be hidden by the skirt. Her arms have swivel/pin shoulders, swivel biceps, pin elbows, swivel glove tops, and her legs have peg hips, swivel thighs, pin knees and swivel boot tops. All of the swivels look quite natural, since they're incorporated in where the figure already has horizontal bands around the limbs - but DC Direct has ignored such opportunities so many times that it's nice to see they finally got it right. She could still have used swivel/pin hips to allow her to broaden her stance, as without those dramatic poses can look kind of awkward, but her joints are perfect for a wealth of subtle fine-tuning of the basic standing pose. Since she's a grown woman with needs, and Mr. 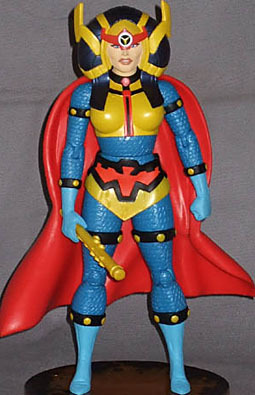 Miracle isn't always around, Barda gets an accessory, her Mega-Rod. It's just a plain yellow rod with various bumps and tubes sculpted onto it, cast in a slightly pearly plastic that I think wants to look gold, but is held back by the necessity to stick close to the artwork colours, so it winds up looking a bit like a toy. Barda's open right hand is a bit too open to hold the rod around its base, but a little further up there are those techy details, and since they widen the rod she can hold it fairly well up there, so long as you get the angle right. She also gets a base, which is handy since her natural pose is straight up with shoulders back, and that leaves the big heavy cape dragging her backwards. 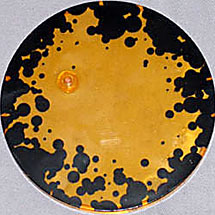 There's one peg for her right heel, and the clear orange base is decorated with black spots - very Kirbyesque, provided you have her on a pale surface to bring out the contrast. 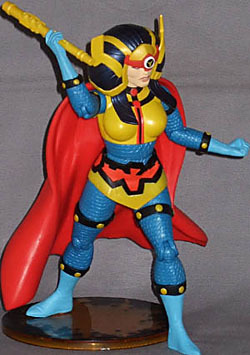 As I alluded to, I frankly expected not to like this figure much - I bought her because (as my Mighty Muggs Asajj Ventress shows) I'm inclined to get characters I like even in forms I'm not really drawn to on technical merit, and for the moment this is the only Barda figure available to me. Now that I've studied her in person... well, the art style still keeps her from being a star in my eyes, but the good sculpt and paint, and the unexpectedly versatile articulation, means that I look at her and think "Yep, that's a good action figure."